Tardive dyskinesia (TD) is a disorder that involves involuntary movements. Tardive means delayed and dyskinesia means abnormal movement. TD is a serious side effect that occurs when you take medicines called neuroleptics. These drugs are also called antipsychotics or major tranquilizers. They are used to treat mental problems. TD often occurs when you take the drug for many months or years. In some cases, it occurs after you take them for as little as 6 weeks. Newer antipsychotics seem less likely to cause TD, but they are not entirely without risk. Gastroparesis is a condition that reduces the ability of the stomach to empty its contents. It does not involve a blockage (obstruction). When TD is diagnosed, the health care provider will either have you stop the medicine slowly or switch to another one. If TD is mild or moderate, various medicines may be tried. A dopamine-depleting medicine, tetrabenazine is most effective treatment for TD. Your provider can tell you more about these. If TD is very severe, a procedure called deep brain stimulation DBS may be tried. DBS uses a device called a neurostimulator to deliver electrical signals to the areas of the brain that control movement. If diagnosed early, TD may be reversed by stopping the medicine that caused the symptoms. Even if the medicine is stopped, the involuntary movements may become permanent, and in some cases, may become worse. Aronson JK. Neuroleptic drugs. In: Aronson JK, ed. Meyler's Side Effects of Drugs. 16th ed. Waltham, MA: Elsevier B.V.; 2016:chap 53. Freudenreich O, Flaherty AW. Patients with abnormal movements. In: Stern TA, Freudenreich O, Smith FA, Fricchione GL, Rosenbaum JF, eds. Massachusetts General Hospital Handbook of General Hospital Psychiatry. 7th ed. Philadelphia, PA: Elsevier; 2017:chap 21. Freudenreich O, Goff DC, Henderson DC. Antipsychotic drugs. In: Stern TA, Fava M, Wilens TE, Rosenbaum JF, eds. Massachusetts General Hospital Comprehensive Clinical Psychiatry. 2nd ed. Philadelphia, PA: Elsevier; 2016:chap 42. The central nervous system is comprised of the brain and spinal cord. 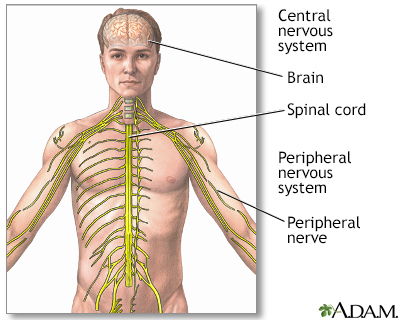 The peripheral nervous system includes all peripheral nerves.